Well before colonization made its first mark on the Philippine islands, our ancestors had a deep connection and stewardship to the land, and understood the importance of preserving and caring for the environment in order to sustain the existence of both the land and the water for future generations. Elders built a relationship with nature and different island communities developed specialized knowledge, rituals, and customary practices that often overlapped with spirituality, healing, and cultural preservation. In current times, extreme weather conditions and global climate disasters are increasing in frequency and intensity and becoming more widespread. Man-made environmental degradation has brought about climate change and, while every living being on the planet is experiencing its effects, those with the least socio-economic capital are the most vulnerable. In the Philippines, typhoons, floods, landslides, drought, and other ecological decimations hit poor and rural indigenous communities the hardest, particularly individuals who are systemically impacted by the policy legacies of colonization and the global flows of capitalism. Therein lies the question – is there a way that Philippine indigenous knowledge and practices from our ancestors and our elders can help our current society both mitigate, and adapt to, the effects of climate change? What can we learn from our ancestors and their relationship to the land on how to care for and preserve the environment? Dennis Gupa seeks to explore this question through collaborative multimedia and multilingual applied theatre. Friday November 2, 9:00 a.m. to 5:00 p.m.: Tuminungnung 2018 Philippine Heritage Youth Forum for Filipino-Canadians ages 14 to 19 on the importance of the arts in preserving ancestral knowledge and practices, and in contributing to the ongoing global conversation on climate change. 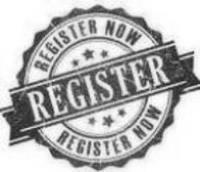 Free to register. Space is limited. 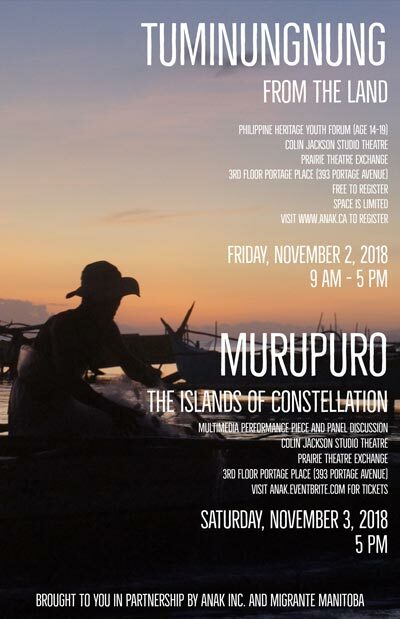 Saturday November 3, 5:00 p.m.: Murupuro/The Islands of Constellation performance and panel discussion with local environmentalists and community members. Johsa Manzanilla is the Director of ANAK and a member of Migrante Manitoba, and is inviting you to not miss out on these great opportunities! Contact info@anak.ca for more information.